MUVEing towards collaboration – the benefits and pitfalls of working as a collaborative teaching in a Multi-user Virtual Environment,” and “In-world, meets the real world – the trials and tribulations of bringing Second Life to an ITP,” presented by Merle Lemon, lead educator in foundation learning, and lecturer at Manukau Institute of Technology and Oriel Kelly, manager of MIT’s Learning Environment Support Technology Centre. Foundation Learning students who used the SLENZ pilot foundation learning programme in Second Life to hone their interview skills did better in real life assessment interviews than those students who had not been through Second Life, according to SLENZ lead educator and senior Manukau Institute of Technology lecturer Merle Lemon (SL: Briamelle Quintessa). The result came from all foundation learning classes in interview techniques – both from those students who used Second Life and those in face-to-face classes – being assessed in real life interviews by an assessor who did not know who had attended which classes. Although Lemon is the first to admit the test was “not scientific” and that the results “might have been confounded by individual class teacher ability” the results point to the benefits of a properly- designed virtual world learning programme used by itself or as a valuable adjunct to face-to-face learning. The result, even if anecdotal in nature, was across the board with students four the four SL classes doing better in the real life interview assessment than those from six face-to-face-only classes. 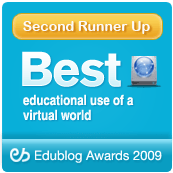 Lemon reported the result as an aside to virtual world teaching workshops she conducted at last week’s annual, national Teaching and Learning/eFest 2009 tertiary education conference at UCOL in Palmerston North, New Zealand. “We tried to get the educators into Second Life as quickly as possible after the project started,” Lemon said. ” We tried to keep everyone on the same page all the time and largely succeeded. On an international collaborative basis she paid tribute for outstanding help – I publish her list in the belief it may be a help to other educators – to Second Life’s MNC (New Media Consortium), CCSL (Community Colleges of Second Life), Google Teacher Academy,Second Life Mentors, Second Life Education, and Second Ability Mentors (for the disabled). She also found the VWBPE (Virtual World Best Practices in Education conference) run virtually in February this year as being invaluable both from a learning and networking point of view and received help from the Education Coffee House, Virtual Pioneers and Media Learning – Danish Visions, the Kiwi Educators group, and COM Educators in Second Life. She reserved some of her highest praise for The International Society for Technology in Education (ISTE) which she described as “the trusted source for professional development, knowledge generation, advocacy, and leadership for innovation” in in-world education and Australian Second Life educator and researcher Jo Kay, of Jokaydia, the Jokaydia annual Unconference , Jokaydia News and Info and Jokaydia Educators-in Rez. Lemon said among the difficulties experienced by her team were: wavering support and/or a lack of commitment; exacerbated by feelings of “inadequacy” and sometimes “panic”; communication problems and the loss of some team members as the pilot progressed. There also was a problem initially with student non-attendance and a lack of computer literacy but this had been overcome with the establishment of a “buddy” system. This had sometimes turned into a problem of keeping track of students: “Make sure they are in your group and are on your friends list,” she said. However, in the five classes taken into SL, there had only been one student who had “resisted” the idea, not for computer or virtual world issues, but because of “privacy” in connection with the other students. In deciding to move learning into Second Life, Lemon said, educators, rather than initially spending lots on their developments etc, without proper research, should consider the existing resources within Second Life and whether they could use these resources, and what needed to be added to them to make them useful for a particular purpose. She recommended, based on her experience, that the lead educator or “champion” of any on-going education project in Second Life should Motivate, Motivate, Motivate team members. She noted that in the Second Life context “knowledge is power”. She added that any education team should hold regular meetings in world and members should lock themselves into the relevant Second Life groups. But, she added, team members must take time to have fun in SecondLife. On Technical and Learning Technology Support Issues, Oriel Kelly, who presented this paper with Lemon, said at MIT, they had found, that Second Life barely ran on a computer with an Intel Core 2 Duo; Motherboard: Intel DG35EC (G35 Express); CPU: Intel E8400 (2Ghz); Memory: 2GB (800mhz) RAM; GPU: NVIDIA GeForce 9500 GT. On the question of network and bandwidth, latency was an issue with computer lab sessions needing 416kb/machine. Firewalls had also been problematic because Second Life’s SIP (Session Initiation Protocol) is non-standard and needed to be passed without being shredded by SIP aware firewalls or declared an “illegal operation”. On the question of access MIT had had problems with single IP NATs (network address translation) registering more than two avatars. “We had a lot of technical problems, ” Lemon said, adding that the major complaints from students had involved technical issues. Many of the problems, Lemon said, could be overcome by involving the technical staff in-world in the Second Life experience. “Once in there and involved in the experiences they are sucked in,” she half joked, adding that previously the technical staff hadn’t been able to see why anyone would want to teach in-world.